I seem to be leeking… | I'm Gonna Cook That! At first, I couldn’t think of any soup puns, but then I remembered there were leeks involved in this recipe and, well, there ya go. The Universe intervened so you didn’t have to feel the deep void that comes from missing out on one of my clever little puns. Anyhoots, it’s Spring for real. The sun is shining (mostly), and the little buds on the trees are opening. There’s asparagus bigger around than a chopstick in the grocery store. And there are leeks. I love leeks. I love that they’re kinda oniony, but milder, and they’re just so pretty and so many shades of green. I find myself throwing them into everything, because to me they just taste like Spring. 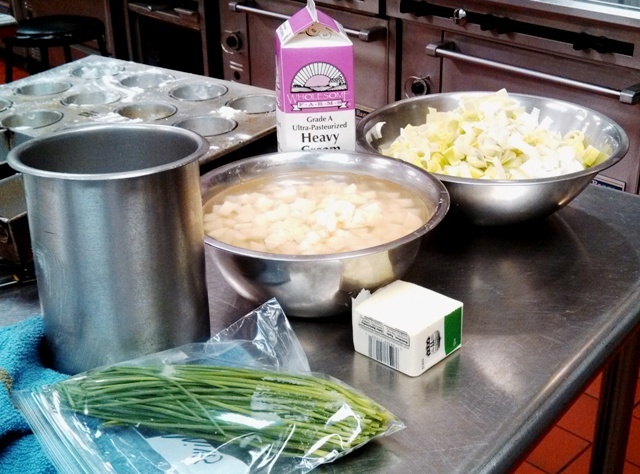 So, I was delighted to find vichyssoise on the menu for class last week. It’s such an old school thing to serve, but so easy to pull together. 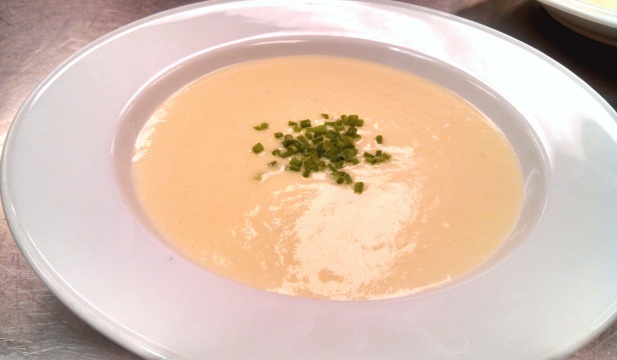 Technically, warm potato-leek soup is called something else, while it’s the cold version that bears the name vichyssoise, but that’s the only difference. I actually prefer the warm version, but that’s neither here nor there. It’s tasty, and light, and a snap to throw together. All the ingredients are easily obtained this time of year, and none of them are terribly expensive, so despite the fancy French sounding name this soup does not require a special occasion. Because it also doesn’t need strict temperature control, it travels well. Pack up a container or a thermos of it for a picnic. Half a sammich and a piece of fruit and you’ve got a pretty delicious little lunch on your hands. Just one note on leeks. They’re grown deep in very sandy soil. The bottom part is white because it doesn’t see sunlight. It can get pretty dirty in between all those layers, which means you need to wash your leeks really well before you use them in anything. This leek cleaning tutorial from Simply Recipes is great. Split the leeks lengthwise, wash well to remove all sand and grit, then slice them. Heat the butter over medium heat and add the leeks and onions. Cook slowly, browning them very lightly. Add the potatoes and chicken stock, season with salt and pepper, and bring to a simmer. 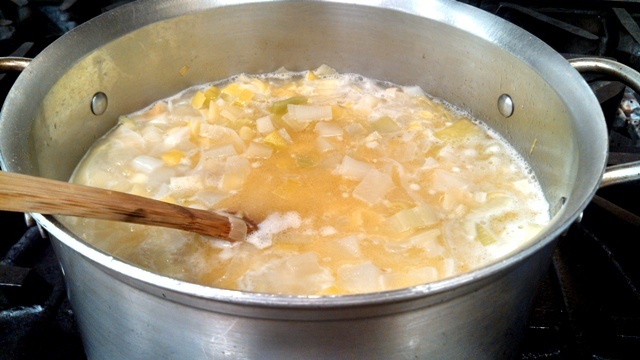 Simmer until the leeks and potatoes are very tender, approximately 45 minutes. Puree the soup in a food processor, blender, or food mill, then run through a fine strainer. Note: I actually skipped the straining step. Most really good blenders can puree this well enough on the first pass that straining becomes pretty unnecessary. You will probably want to puree it in a couple of batches to make sure you can get it completely smooth, and to avoid the inevitable volcanic eruption that happens when you overfill a blender with hot liquid. Return puree to the heat and add the milk and ½ cup of cream. Season to taste and return to a boil. Let cool, then add remaining cream. Chill thoroughly before serving, garnished with snipped chives. Easy, right? The 45 minutes of simmering gives you time to pull the rest of the meal together. Or clean up a little. Or mix yourself a beverage. Or maybe even take a nap. I support you, however you choose to utilize your simmer time. Do you consider the “inactive” cooking time in recipes an opportunity to relax, or do you stay in the kitchen the whole time? Let me know in the comments! list. Unfortunately, the little people in my house usually prevent me from any “inactive” time. Ever. Seriously. It’s annoying and was not mentioned in the manual. One of these days they’ll be old enough to willingly entertain themselves, right? I wish there was some way to “gift” some of my inactive cooking time to you.